(Nanowerk News) A team of researchers from the University of Michigan and Western Michigan University is exploring new materials that could yield higher computational speeds and lower power consumption, even in harsh environments. Making a radiation-resistant spintronic device requires a material relevant for spintronic applications that can maintain its spin-dependence after it has been irradiated. 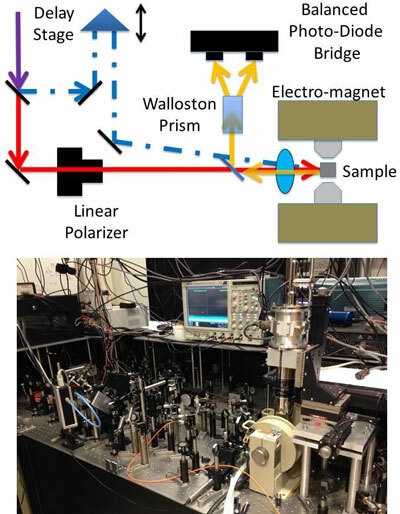 In a paper published in the journal Applied Physics Letters ("Robustness of n-GaAs carrier spin properties to 5 MeV proton irradiation"), the Michigan research team presents their results using bulk Si-doped n-GaAs exposed to proton radiation. Modern electronic devices use charges to transmit and store information, primarily based upon how many electrons are in one place or another. When a lot of them are at a given terminal, you can call that 'on.' If you have very few of them at the same terminal, you can call that 'off,' just like a light switch. This allows for binary logic depending on whether the terminal is 'on' or 'off.' Spintronics, at its simplest, uses the 'on/off' idea, but instead of counting the electrons, their spin is measured. "You can think of the spin of an electron as a tiny bar magnet with an arrow painted on it. If the arrow points up, we call that 'spin-up.' If it points down, we call that 'spin-down.' By using light, electric, or magnetic fields, we can manipulate, and measure, the spin direction," said researcher Brennan Pursley, who is the first author of the new study. Studying spintronic materials required that the research team combine two well established fields: the study of spin dynamics and the study of radiation damage. Both tool sets are quite robust and have been around for decades but combining the two required sifting through the wealth of radiation damage research. "That was the most difficult aspect," explains Pursley. "It was an entirely new field for us with a variety of established techniques and terminology to learn. The key was to tackle it like any new project: ask a lot of questions, find a few good books or papers, and follow the citations." Long term, knowledge of radiation effects on spintronic devices will aid in their engineering. A practical implementation would be processing on a communications satellite where without the protection of Earth's atmosphere, electronics can be damaged by harsh solar radiation. The theoretically achievable computation speeds and low power consumption could be combined with compact designs and relatively light shielding. This could make communications systems faster, longer-lived and cheaper to implement.